And if you can accept the Asgard’s appearance, everything else on the show is easy. Stargate is an admittedly tough one; its first few seasons are rough, but SG-1‘s heavily arc-based nature means that the things discovered in those episodes just keep coming back and staying relevant, meaning you can’t just flat out skip them. Starting off with half a dozen bad episodes means that even dedicated sci-fi fans might be willing to write it off. Both Atlantis and Universe are controversial for different reasons, so they don’t make great starting points either (although I initially checked out Stargate due to Robert Picardo’s role in Atlantis). And the movie’s slow, boring pace and major differences from the series are definitely not a good choice for hooking someone on the franchise. So what does that leave us with? My recommendation is a Season 1 episode, “Thor’s Hammer.” Unlike most people, I don’t think starting with a standalone episode is the best approach. A lot of the time, the episodes people recommend (“Window of Opportunity” frequently comes up) still require some knowledge of the characters, or like that episode, just flat out give a distorted view of a typical episode. I certainly wouldn’t pick something with so many repeated scenes as a first time experience. 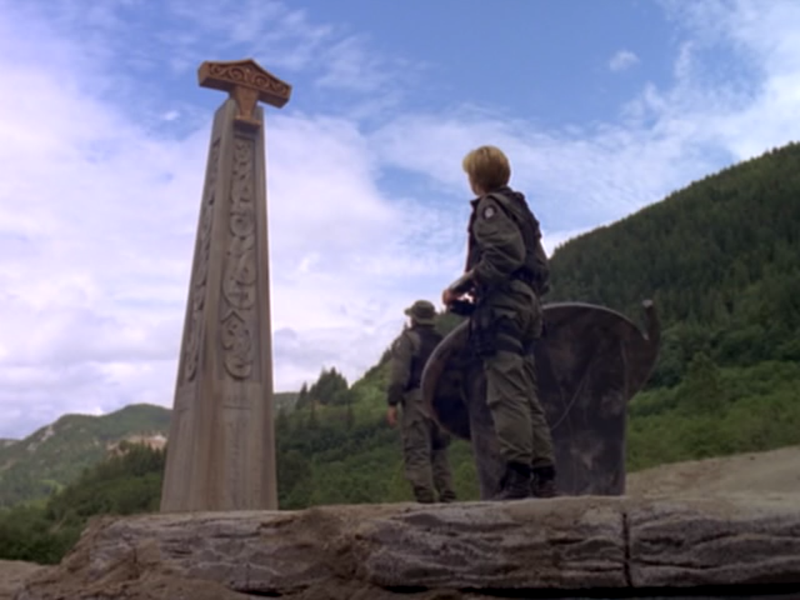 “Thor’s Hammer” makes a better first, in my opinion, because it’s more typical of the problems that SG-1 faces, and it involves many elements that will become extremely important to the series as it progresses: the Asgard, Teal’c’s symbiote and Goa’uld origins, the extent that the team will go to for each other, and shows off everyone’s talents fairly equally. I also considered “the Fifth Race,” but I feel like this one is better to start on. Massive, implacable, and inscrutable. An entrancing mystery. Star Trek has an even bigger back catalog of episodes to choose from than Stargate, and a longer history to boot. Most people would be willing to agree that while the Original Series is absolutely still worth watching today, it’s not a good place to start someone off. Cheesy effects, costumes and sets throughout, and the attitudes and styles of the day aren’t always accessible to modern audiences. It also has slightly slower pacing and much more subdued editing and camerawork than we’re used to on more recent shows. The movies generally need some degree of familiarity with the characters to fully enjoy, and that goes beyond the basic pop culture impressions of them. Deep Space 9, while highly enjoyable, spends much of its time deconstructing ideas of the Federation that were only established in the other shows first. Voyager and Enterprise? Best not to even get into that. No, the best starting point for Trek is the obvious one: The Next Generation. TNG revived the franchise on the small screen and established the era that the other spinoffs exist in. Its first season is slow, with some truly atrocious episodes right off the bat, starting with the pilot is a bad idea. Better to start with “Q Who,” a second season episode that contains many of the major plots that resurface throughout the series. 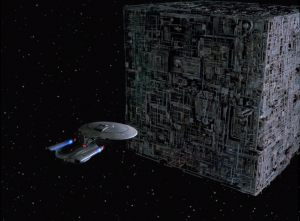 It introduces the Borg, a powerful and dangerous enemy with ships unlike anything seen before. It’s got Q, whose appearance in the pilot is one of the highlights and presence acts almost universally as a marker of a good episode. It establishes Guinan and her unusual abilities. There’s a direct challenge to Federation ideals, necessitating that Picard and the crew prove themselves. The tense atmosphere of the episode is great to pull you in, and as a single episode it does better than something like “Best of Both Worlds.” Other great episodes of TNG tend to be more philosophical or involved in ways that might be difficult for a newcomer to appreciate. You’ll feel as fatigued as the crew after watching it. 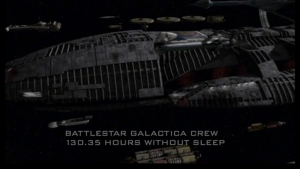 While Star Trek and Stargate are series where starting from the beginning might confound your enjoyment of them, BSG doesn’t have that problem. The 2003 Miniseries is a perfectly adequate place to start, and with as heavily serialized as it is, there aren’t many opportunities to jump in later on (although you probably wouldn’t want to). Despite being a prequel, Caprica is a terrible place to start, and only a masochist would pick Blood & Chrome to start themselves on. So with that all out of the way, the only regular episode of the reimagined series that might make a good entrance point is “33.” It’s the first episode as a full series, and has an almost exhausting level of intensity to it. The dire situation that the fleet is in really hits hard, and just how outmatched they are quickly becomes apparent. The Cylons are immediately established as a threat worthy of respect, and with the characters stretched to the breaking point, what they’re made of shines through. The museum of alien artifacts also helps to convey how vast this universe is. Doctor Who is the single longest running sci-fi series ever, and the longest in terms of hours of footage. 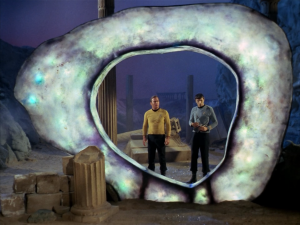 On the other hand, that means the same problems crop up as with Star Trek and TOS: extremely dated props, sets, and costumes, along with the now-rare “serial” format mean that any one story of Classic Who will take several hours and some generous suspension of disbelief. The TV Movie might seem like a reasonable place to start, but its mixed reception and the fact that McGann’s tenure was extremely short make it far less suitable. And trying to start with a spinoff like Torchwood or Sarah Jane Adventures would be a very roundabout way of getting involved, especially with Torchwood‘s uneven quality and dark subject matter relative to the parent show. No, the best way to get involved with Doctor Who for a modern viewer is with the modern version of the show. While many people will suggest “Blink” as a good first episode, I feel like the Doctor’s absence from the episode gives a very inaccurate impression of what the rest of the series would be like. Starting off with “The Eleventh Hour” isn’t a bad choice, as the Doctor rediscovers who he is, but it still leaves a lot of important aspects out. And “Rose,” as the first episode of the revived series, works okay except for the goofy enemy in place. 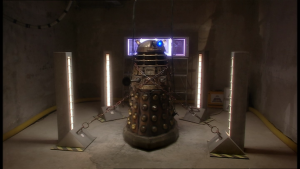 For that reason, I choose “Dalek” as my preferred introductory episode. It re-establishes one of the Doctor’s greatest enemies, and gives the Daleks back their intimidation that had been lost through the years as they were rendered campy and weak (more a problem for British viewers, who might have pop culture ideas of them lingering). It gives backstory on the Doctor, and shows why the role of the companion is such an important one. My personal introduction to Doctor Who was the last 10 minutes of “Partners in Crime,” which left me a little intrigued and mostly baffled. I didn’t even know it was Doctor Who at the time. Definitely not a good choice, but it didn’t stop me from enjoying it when I eventually rediscovered the show. Ok this might’ve been your best list yet. In fact, I think you should consider turning it into a permanent guide and keep adding entries for different franchises. Isn’t it funny that the answer is never the pilot, when that’s actually what the pilot is specifically intended to do? I would be curious to see what you would pick for B5 especially (something I’ve seen every second of, including all the movies and spinoffs) since you mentioned it. This is because of your idea to not just default to the “best” episode, but to focus on an example that is truly representative of what the series is like! Well done. I particularly agreed with #1 and 2. For Trek, I feel like every series is different enough that you could make a selection for each one now that you’ve done so for the franchise as a whole. I know a lot of people these days have come to it through the JJA reboot movies — personally that seems like a terrible idea as it relies on Old Spock and the original universe so much — but I can see why since it is so expensive looking and fun \ flashy… however that also makes it too Star Warsy to use here. 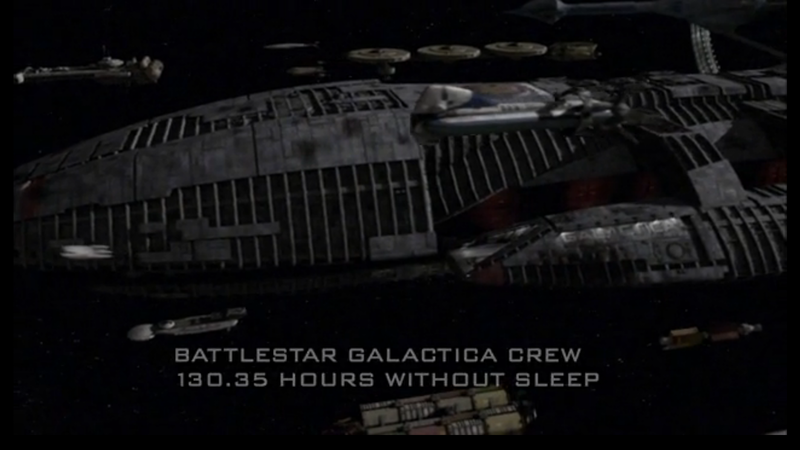 Both show the ship, the setting, the world, a common situation, and are overall quite good episodes. Well executed but starring crew members you will never see before or again, so you don’t have to know hardly anything going in. The usual cast are all encountered briefly so when you get into the rest of the series later it is not jarring. They are late in the runs of the shows so everything is firing on all cylinders, so to speak, and it is evident. To me, the Voyager one is better at this task because you get to see Captain Janeway at her best. Very useful if you are trying to expose Trek to a woman, by the way. Even though I’ve also seen every episode of DS9 and ENT, I do not have suggestions for those off the top of my head. Do you? It could definitely be done for individual shows, but my goal was mostly to help newcomers deal with the intimidating nature that these massive franchises can have. It’s a shame to have people be scared off of something they might enjoy just because they got the wrong idea or just couldn’t figure out where to start. Prequels especially cause problems in this regard, since new fans will sometimes try to watch them first and be left even more confused and locked out. That’s why I don’t recommend starting with Enterprise, even though you see people suggest that from time to time. And I wouldn’t say I’m obsessed with Defiance, more that I spent a lot of time banging my head against it when it was the only sci-fi show left on the air. :p That’s not a bad episode to start with, although I might pick “I Just Wasn’t Made For These Times,” two episodes later. It’s turned out to be a weirdly important episode, and it’s one of the few times all our characters are getting along and enjoying themselves. As far as B5 goes, I would have to think about it some. I definitely wouldn’t start with the “The Gathering” pilot because it’s so boring and so many of those characters never return. That’s what turned me off the show on my first try watching it. It would probably be an early/mid season 2 episode once Sheridan had showed up.